Exerpts taken from the history “All for God’s People” by Sr Marietta Gouws. The Holy Father had also appealed to religious institutes to send missionaries to Latin America where the Church is in a sorry state. Although the natives of Bilivia embraced Catholicism after the Spanish conquest, dure to the paucity of Priests for centuries, most of these people now know next to nothing about the religion itself…. With great generosity the Congregation decided to assist these people of Latin America, and volunteers were called for from among the Sisters. and at Buenos Aires on 13 April 1971. On the evening of 17 April they boarded the train which would take them to Santa Cruz, where they arrived on 20 April 1971. 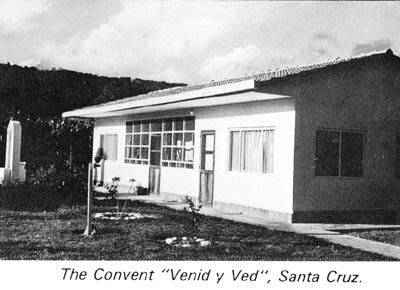 While they waited to occupy their new convent, “Venid y Ved”, Casilla 2079, El paraiso, the sisters were obliged to stay in a home for the poor and homeless. The original plan to open a kindergarten had to be abandoned but Sr Marie Andree began teaching catechism in a public school in the neighbourhood. The urgent need for a full-time nurse motivated the Sisters to ask for one, and Sr Birgit Strock joined them from South Africa in early 1972. A clinic was begun in a room in the Sisters’ Convent until funds were obtained from the Misereor Foundation in Germany to extend the Convent and erect a separate clinic. This developed into a children’s clinic with health education offered to individuals, patients being referred to the doctor or hospital. Forestal, 38 km from Santa Cruz, is hidden in the forest and is situated between banana and sugar plantation. 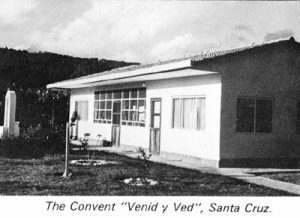 The Sisters arrived there in January 1973 and used 4 classrooms as a temporary convent until they could build a small convent and a suitable clinic with the aid of funds from the Swiss Lental Appeal and from the Congregation. Sr Marie Andree was appointed Principal of the school and was assisted by four Bolivian lay teachers. Teaching in Bolivia was not easy, political unrest at times forcing the closure of schools. Teachers are often poorly trained and often indifferent; Many challenges face the Sisters in their work: Lack of transport facilities, poverty, ignorance, malnutrition and diseases such as malaria, tuberculosis, typhoid, typhus, scabies, goitre, leprosy and anaemia caused by worms, gastro-enteritis, etc. 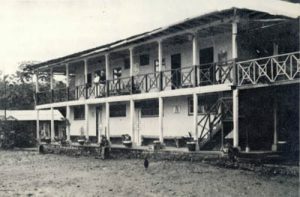 The Sisters working in Forestal would leave their Convent at Santa Cruz on a Monday morning and return and return from Forestal at the weekend for Sunday Mass. They carried all their provisions and medical supplies for the week in their rucksacks and were allowed to carray the Blessed Sacrament with them to their little Chapel at Forestal as a priest was able to visit only about three or four times a year. The mission at Forestal placed a great strain on the Sisters in Bolivia because there is no telephonic or other means of communication by which the Sisters in the campo can notify their companions at Santa Cruz of their safe arrival, nor why they sometimes cannot come home for three weeks at a time when the rivers are impassable. Those at Santa Cruz can only conjecture that it has been raining heavily in the forest and the roads are not negotiable. The clinic wass maintained almost entirely by donations from abroad and was the only medical centre within an area of about 40 sq. miles. On 17 November 1975 Sisters Nives Kastner, Nicolai Bramlage, Maureen Mueller and Ingrid Krebes arrived at Puyo, following the 1974 General Chapter’s decision to “launch out into the deep”, despite the difficulties of reinforcements facing the Congregation at the time. They had been met at Guayaquil harbour by Bishop Tomas Ronero OP, the Vicar Apostolic of the newly-created Vicariate of Puyo in Ecuador. The territory, the greater part of which is in the jungle, was enormous and the Bishop was desperately in need of Sisters to help him and his few priests.The Sisters were assigned some “Caritas” work of the Vicariate which entailed visiting some of the indigent homes and ascertaining their needs, distributing clothing and canned provisions. They were approached by several people requesting religious instruction for their children. During February 1976 the annual course for training lay apostles to carry on the work of spreading the Word of God to outlying districts, was held at the Sisters’ centre in Puyo. Such lay helpers would prepare children for the Sacraments, gather the people to Bible Services, visit the sick, thus keeping the Christian Community together. in a part of a Primary School with a small hostel attached. The Sisters have introduced various improvements, such as providing each child in the hostel with a blanket and a simple mattress, teaching gardening to the children and adults. Sister Ingrid attends patients at the clinic once a fortnight, gradually extgending the radius of activities by day visits of a nurse to a few more isolated dispensarios. On 1 April 2011 Sisters Veronika Hornung and Verena Volk arrived by truck at Picoaza, a marginalised township of Puertoviejo, the capital of Manabi Province in Ecuador, to take up residence in their new community named “Maria de Nazaret”.